The majority of this year’s UK students were satisfied with the quality of their courses, a survey suggests. The National Student Survey (NSS) found 84% of the 304,000 final-year students at 530 institutions who took part were content with their degree courses. The poll is published by the Higher Education Funding Council for England. But the results follow a similar survey which found levels of satisfaction with “value for money” at university have been falling over the past five years. 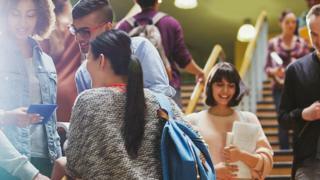 The Student Academic Experience Survey, published by the Higher Education Policy Institute and the Higher Education Academy in June, found just 35% of students across the UK thought university was “good” or “very good” value, compared with 53% five years ago. However, the NSS found student satisfaction with teaching was high, with 85% of UK students agreed that teaching staff were good at explaining things and made their subjects interesting and that they were intellectually stimulated and challenged. It also found 84% of students agreed that they were provided with learning opportunities such as exploring ideas in depth and applying what they had learnt. Some 77% agreed that they felt part of a learning community and had the right opportunities to work with other students. While assessment and feedback were considered to be good by 73% of final-year students. The NSS survey comes as Universities Minister Jo Johnson has highlighted growing concerns about students not getting value for money. Mr Johnson has said the newly established Office for Students will see students given formal contracts with universities, so they can challenge them about too few teaching hours or if facilities are inadequate. Commenting on the NSS, he said: “While overall student satisfaction remains high, we know there is significant variation in teaching quality and outcomes both within and between providers. Prof Madeleine Atkins, chief executive of Hefce, said the survey had been enhanced this year by new questions on student engagement and approaches to teaching and learning. “The NSS continues to be the largest and most authoritative survey of its kind in the UK,” she said. “The 2017 results show that students provide particularly positive feedback on the quality of teaching and on learning opportunities. Nick Hillman, director of Hepi, said the NSS needed to be set alongside other findings from much broader surveys, which show students complaining of declining value for money. “I am particularly struck by the lower figures in the NSS for assessment and feedback, which continue to be a challenge but are essential to full student engagement.